This guy is about 6 inches in total height but has quite a broad wing span with leaves that fan out horizontally in all directions. It has white dash-like bumps all long the leaves but that don't quite line up like I would expect Haworthia leaves to line up. Also, the bottom leaves have started turning a bit brown at the edges. Am I doing something wrong? Sunburn possibly? These sit in my office window and get southern light all day. I water it about once every 3-4 weeks with very little water. 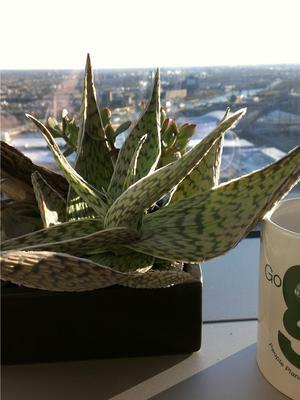 Hi Jessica, what a gorgeous plant! 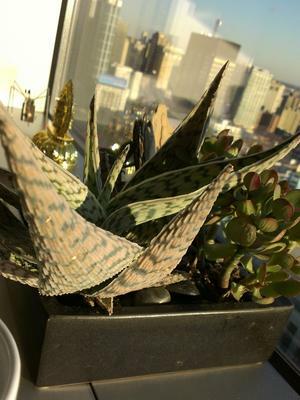 I'm pretty sure this is an Aloe, not Haworthia, but I'm not sure which variety or species it would be. There are a whole lot of new varieties such as the gorgeous 'Pink Blush' and many others. As it's in such a shallow pot, you could probably water it a little more often - and don't tease - give it a good drink, let it drain out the bottom, and then give it another good drink. Teasing it by only giving it a little bit won't allow it to plump up all the cells; it's only enough to survive on. The curling inward that you see on the leaves is indicating that it's not getting enough water. That should also help with the coloring, which is a sign of stress, and also a normal part of the plant aging. The older bottom leaves do eventually shrivel and dry up, and in time, the stem will elongate as it makes more new growth from the center. 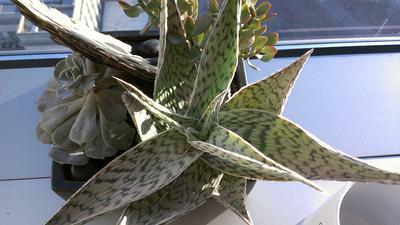 See more about Aloe and Aloe succulent plants here. You can see more instructions for succulent care here. Hope that helps with your lovely plant! Thanks for the help, Jacki!